Nonstop blooms all season long! Frilled, white petals border yellow hearts and bloom early summer to frost. Grows 2-ft. tall. Full to partial sun. Zones 4-9. No. 2 bareroot. One offer is 2 plants. Zone 3 - 9 (-20° F.). Height 20 - 24 inches. For each offer ordered, get 2 plants. 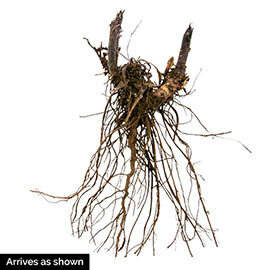 Depth: Plant with crown(where the roots meet) at soil level. Color: White with yellow centers. Foliage: Lustrous dark green leaves with coarsely toothed margins. 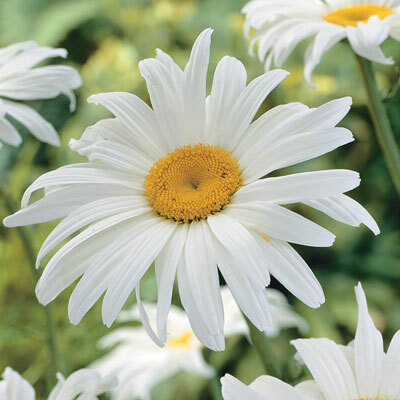 Flower Form: Large 3 inch daisy flowers with yellow centers. Pruning: Dead-head to remove spent blooms. Allow foliage to die back. Size: 2.5 - 3 inch blossoms.